What year is this? 1880? 1922? 1957? 1963? 1978? 1982? 1997? 2010? As I was browsing Costco’s book section, I came upon the following: The Boys’ Book of Adventure: Are You Ready To Face The Challenge? & The Boys’ Book of Greatness: Even More Ways To Be The Best at Everything followed by The Girls’ Book of Glamour: A Guide To Being a Goddess & The Girls’ Book of Friendship: How To Be The Best Friend Ever. 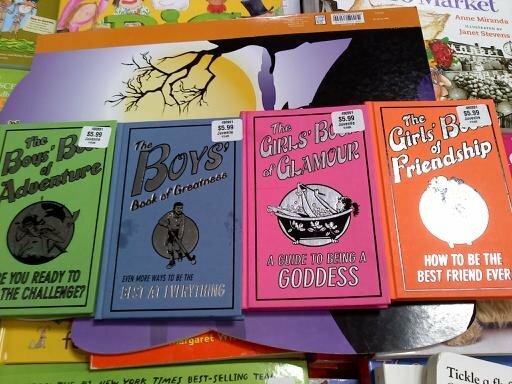 Isn’t it lovely how Scholastic Books is publishing books that enforce gender-segregation (complete with “girl” and “boy” colors) which essentially maintain: little girls should be solely concerned with physical appearance and maintaining a relationships. Is adventure and greatness not suitable for little girls? I flipped through each of the books and found sections on “How to dress like a celebrity even if you’re not one” and “How to tie knots”. Guess which one was for little girls. We often begin projecting socially constructed gender expectations on children before they’re even born, decorating the nursery in a specific color scheme. As soon as that child enters the world, the color codes, pierced ears, head bands on nearly bald heads and other clothing items designed for infants erect the gendered foundation that will provide the template for much of their lives. Add in toys, books, cartoons and video games and that foundation sprouts a framework for their identity, their relationships with others and their world view. Throughout this process of gender socialization, beauty (with a disturbing increasing emphasis on “sexiness“) and relationships are emphasized for girls while independence and adventure are emphasized for boys.This trend continues well into adulthood through various agents of socialization, primarily the mass media which advertises normative masculinity and femininity. Boys and men could learn a thing or two about cultivating and nurturing relationships. Enough with the lone adventurer- lets raise sensitive, strong and emotionally attuned boys and men. Simultaneously, beauty and relationships aren’t enough for girls and women. We need to redfine girly, offering our girls intellectual and physical challenges beyond the vanity and devalued emotional work. We have much to gain from offering a full range of choices to boys and girls and valuing them equally. For a fantastic video that re-imagines the Bronte sisters, see Step Aside Princesses, Here Come the Boomerang-Throwing Bronte Sisters. Photograph courtesy of Jessie T.